STR-H039, STR-H048, STR-H054, AND STR-H063. ALT-2314: 12V, 150A, USED ON NISSAN INTERSTAR, OPEL MOVANO MODELS. ALT-2403: 12V, 140A, USED ON BMW 1 SERIES AND 3 SERIES MODELS. ALT-H213: 12V, 90A, USED ON TOYOTA YARIS MODELS. STR-2293: 12V, 1.1KW, USED ON TOYOTA AVENSIS, COROLLA MODELS. STR-B104: 12V, 1.0KW, USED ON CITROEN C1, PEUGEOT 107 MODELS. STR-H054: 12V, 2.0KW, USED ON AUDI A3, VOLKSWAGEN SUPERB MODELS. ALT-5144: 12V, 100A, USED ON ALFA ROMEO 159, BRERA MODELS. ALT-5309: 12V, 40A, USED ON KUBOTA OFF HIGHWAY MODELS. ALT-H183: 12V, 70A, USED ON TOYOTA YARIS MODELS. STR-H048: 12V, 0.7KW, USED ON TOYOTA YARIS MODELS. 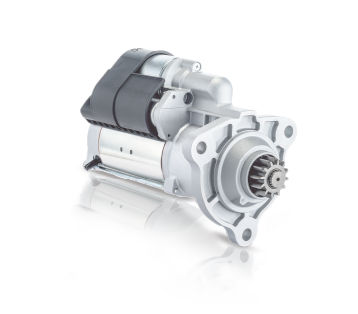 ALT-F010: 12V, 110A, USED ON FORD TRANSIT MODELS. ALT-H126: 12V, 110A, USED ON NISSAN PRIMERA, X-TRAIL MODELS. ALT-H133: 12V, 90A, USED ON MAZDA 6 MODELS. ALT-H214: 12V, 110A, USED ON MAZDA 3 MODELS. ALT-H234: 12V, 110A, USED ON NISSAN KUBISTAR, RENAULT CLIO MODELS. STR-6146: 24V, 5.0KW, USED ON HITACHI EXCAVATOR MODELS. STR-7046: 12V, 1.0KW, USED ON SUZUKI IGNIS, JIMNY MODELS. 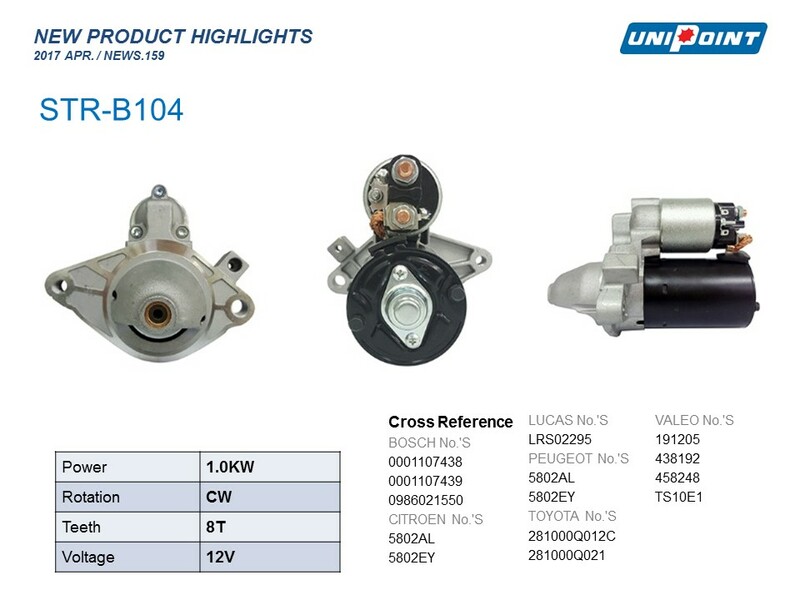 STR-H063: 12V, 1.4KW, USED ON MAZDA 3, 5, 6 MODELS. ALT-H229: 12V, 120A, USED ON HYUNDAI ELANTRA, SANTA FE MODELS. ALT-7025: 12V, 90A, USED ON CITROEN C3, XSARA MODELS. ALT-7236: 12V, 110A, USED ON FIAT DUCATO, DUCATO MAXI MODELS. ALT-H144: 12V, 110A, USED ON HYUNDAI SANTA FE MODELS. ALT-H218: 12V, 90A, USED ON KIA SOUL, CARENS MODELS. STR-4711: 12V, 1.1KW, USED ON VOLKSWAGEN BEETLE, EOS MODELS. STR-H039: 12V, 2.0KW, USED ON VOLKSWAGEN LT BOX MODELS. You can find the detailed spec, cross reference numbers & applications from our Unipoint News #159.